The price of bitcoin at other, large exchanges has continued to follow the high volume move at Mt. Gox Monday. The bid/ask for bitcoin at Coinbase has risen to $110.64/$111.72. Additionally, Coinbase provides some metrics on the Bitcoin network, which show that Monday’s big move also coincided with a record amount of bitcoin transactions. A bitcointalk forum member, Klao, posted an excellent analysis of the recent move at Mt. Gox, which has been the source of much excitement this week. Grouping the orders together into round chunks, Klao suspects that a single whale, or large order trader, was behind most or all of 17,500 bitcoin purchased over a few hours, which made up most of the volume and accounted for most of the increase in price. Additionally, several well-written research pieces have been released this week which address policy-makers and the public at large. Leading the pack, the Washington Post had a feature story on 5 Surprising Facts about Bitcoin. 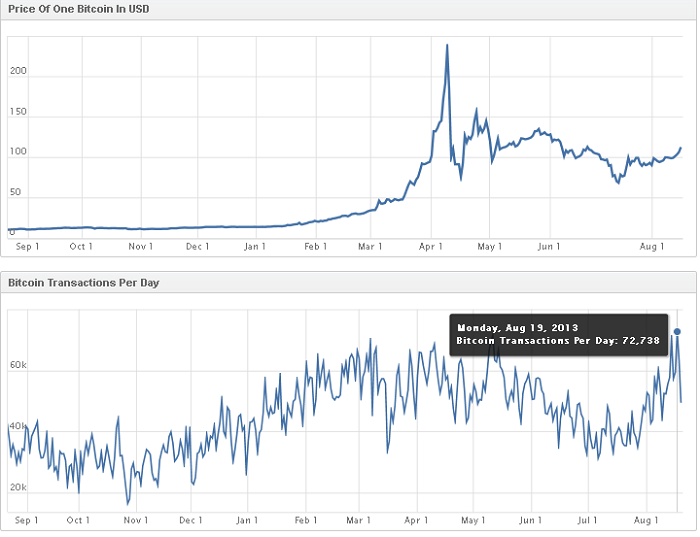 The Hill also downplayed digital currencies’ risks while highlighting the potential benefits. However, the real gem this week was the publication of the nearly 50 page “Bitcoin Primer” by Jerry Brito and colleagues at George Mason University, along with a request from Brito on the bitcoin reddit forum to send it over to your friendly, local Congressperson for they or, as is very likely, their interns to read.